This isn’t the first time I’ve tried peanut butter cookies. There was a semi-failure a while back, in which I tried the “amazing” flourless peanut butter cookie recipe that’s all over the internets. Well, they weren’t bad, but they weren’t great either. Not moist, not chewy. More crumbly and powdery than anything. So when I asked a coworker if he wanted something baked for his birthday, and he asked for peanut butter cookies, I figured it was the perfect time to adjust, experiment, and cobble together something better. Please note,. . . Read More! When I was growing up, my folks used to make a huge batch of spaghetti sauce every now and again. Seems like we always had some in the freezer, and it was always freakin’ delicious. I learned to make it, and just threw down a batch the other day. It works as spaghetti sauce. It works in a lasagna. And if you chuck a can of beans and some cumin into it, it’s an awesome chili. I say “easy” in that it is indeed easy, but this is a simmered. . . Read More! 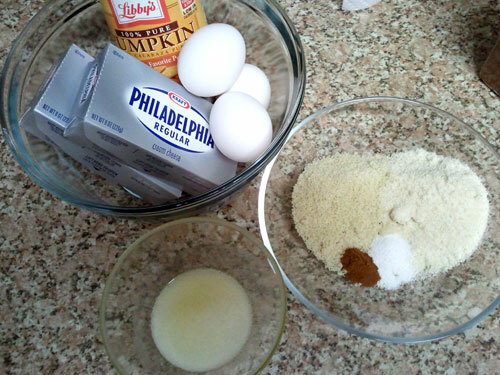 It’s a baking time of year, and I’m not about to let low-carb or gluten-free get in my way. Also, it’s a pumpkin time of year, and Scott loves pumpkin pie. I figured this would be the best of all worlds. As a note, I don’t think I’ve ever had pumpkin pie before. Sure, my parents made one every Thanksgiving. But I wasn’t all that big on Thanksgiving foods in general — I ate Spaghetti-O’s or macaroni and cheese throughout my childhood, because absolutely nothing on the Thanksgiving table sounded. . . Read More! I’ve had this recipe card in my file for about 15 years. I really should make this stuff more often. If you’ve ever been to Duke’s in Seattle, you know how great their chowder is. Their take-home recipe isn’t quite there, but it’s really good anyway. I’ve also made a few small adjustments of my own. 2 slices diced bacon 1 Tbsp butter 1/2 onion, diced 2 stalks celery, diced pinch of chopped fresh garlic 1 tsp thyme 1/2 tsp marjoram 1/2 tsp Italian seasoning 1/4 tsp black pepper 1/4. . . Read More! I’m enjoying the ongoing coconut flour experiments. This time, I went for a classic: chocolate chip cookies. Please bear in mind, these aren’t specifically low-carb chocolate chip cookies. I used actual sugar and actual chocolate chips in this one. Although if they’re going to just be a treat, and if you’re on maintenance, they can certainly fit into a low-carb lifestyle. There are two main problems with using the coconut flour. One is that the cookies don’t flatten and spread like wheat flour cookies do. They stayed in virtually the. . . Read More!